’m sure you’ve heard by now, but it never hurts to go over it again ... For 2 1/2 weeks in late January through mid-February the galaxy cosmically aligns bringing creatives and makers and those that support them to Tucson, Arizona. Researchers, gemologists, authors, artists, gem cutters, miners, and nearly 4,000 companies in the fields of jewelry, gems, minerals and fossils gather from around the world bringing their treasures, knowledge and expertise to share and sell at over forty venues throughout the City of Tucson. They buy, sell, deal, negotiate, mind-meet, rekindle old friendships and nurture new ones in huge tents, expo halls, hotels, warehouses, and the big Convention Center downtown. We at Xpo Press call the event the “Tucson Showcase of Gems, Minerals & Jewelry,” the granddaddy of all gem shows everywhere. And a little “Club Show” started it all — 52 years ago. These days, some call it the “Main Event”, and the once-tiny Tucson Gem & Mineral Show has grown into one of the most respected mineralogical events in the world. It was the “Tucson Gem Show” years before other satellite shows in Tucson started popping up to take advantage of the buyers from around the country (and the globe) attending the original Tucson Gem & Mineral Show ... the spelling which, now, legally, needs to end with the registered trademark: Tucson Gem & Mineral Show®. The 17-day frenzied beauty that is the Tucson Showcase concludes with the four-day Tucson Gem & Mineral Show® at the Tucson Convention Center, the “Main Event,” produced and operated by the Tucson Gem & Mineral Society. If you’ve never stayed in Tucson long enough to attend this show at the Tucson Convention Center, you need to add a few days to your Tucson trek next year. You’ll learn the mysteries of mineralogy without even realizing it! Today, the Tucson Gem & Mineral Show® is the largest and one of the oldest and most prestigious gem and mineral shows in the world. But it wasn’t always like that. In 1946, a small group of lapidary and mineral hobbyists established a gem and mineral society (a club) in Tucson. From the beginning they wanted to offer support and expertise to a growing national interest in the earth sciences. Just two years later, they produced their first show. The modest event was the first gem and mineral show to bring the hobby enthusiast, the public, curators and professionals together for discovery and discussion, as well as providing a forum for mineralogists and gemologists to sit across the table from each other. One of the responsibilities that comes with a mission to educate is the necessity to motivate that learning. To that end the Society show has a feature that one won’t find at most commercial shows — Educational Displays. These displays constitute nearly half of the show, placed by museums, private collectors and hobbyists. Displays fall into two categories Guest and Competitive, providing a rare window into private and museum collections artfully exhibited in 30”-66” glass display cases — all interpretations of the annual theme. What is a crystal? Wikipedia defines, “A crystal or crystalline solid is a solid material whose constituents (such as atoms, molecules or ions) are arranged in a highly ordered microscopic structure, forming a crystal lattice that extends in all directions.” And “crystal form” refers to the six basic crystal systems formed from crystal lattices (groups of atoms repeated at regular intervals in three dimensions with the same orientation). Each of these systems can be related to a specific Gem or Gem Group. This year is going to be filled with gemmy specimens and beauty, untouched by man (except for a good bath), courtesy of Mother Earth. 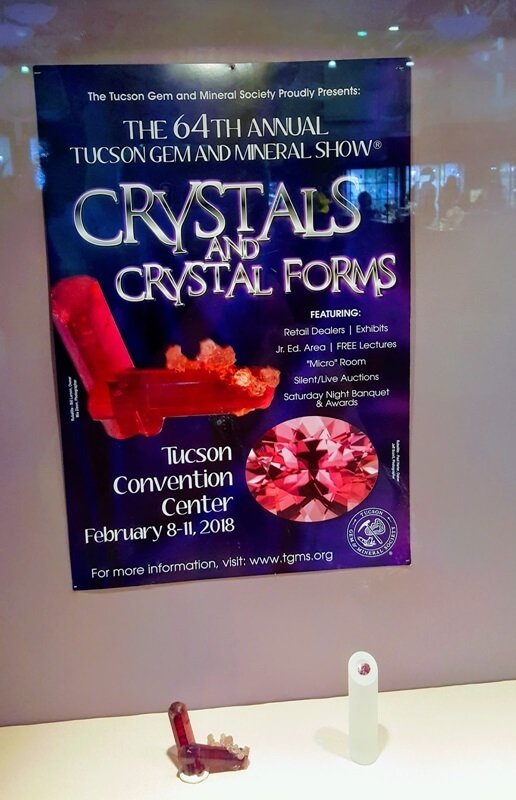 The Tucson Gem & Mineral Show® is the only show in the vast Tucson Showcase that charges an admission fee — $12 plus $1 Tucson Convention Center ticket tax. Proceeds generated by the show remain in the Tucson economy and are used to support mineral knowledge and appreciation. The Society has supported the mineral collections at The University of Arizona and the Arizona Sonora Desert Museum on an annual basis for over forty years. These grants provide extra funds for the acquisition of minerals and advance the growth of each collection. The Society also funds a graduate scholarship in the Geoscience Department at The University of Arizona and a scholarship for the Boys and Girls Club. Proceeds generated at the silent auction and from show admissions have also helped advance knowledge in mineral publications such as Rocks and Mineral Magazine, The Geo-Literary Society, Mineralogy of Arizona, and The Mineralogical Record. Most professionals in the gem and mineral fields will attest to discovering an interest in rock collecting at an early age, and the Society hopes to impact these curious young minds today. They do this by sharing the adventure of field collecting and the beauty of minerals in two separate annual events that focus on kids. With an eye to the future, the Society and the show committee invite over 2,000 elementary students to attend the show on Friday morning of show week (February 9 for the 2018 show), free of charge, with their teachers and chaperones. They are afforded a private showing and provided the opportunity to view the exhibits and shop special merchandise that the dealers have assembled especially for them.